Rosary for Vocations followed by a "town hall"-style meeting focusing on best practices for membership led by Serra International President Dan Jones. The last Saturday of every month, Serrans from all over the world are invited to join together in a recitation of the Rosary for vocations. In June, join hundreds of Serrans attending our Serra International Convention in Rome for our prayer in the official languages of Serra (Spanish, Italian, English, and Portuguese... plus perhaps more!). Please join us for our monthly international prayer of the Rosary for vocations. We will begin our prayer at 8:00 AM CDT (-5.00 GMT) . You can also dial in using your phone. Dial the number for your geographic location below and enter the access code. Let us use today's technology to unite us in our Serran mission through prayer. Humble prayer plants the seed of all great things, including awareness, affirmation, support and awakening to the call of vocations. Please join us! The Phone: If possible, use a regular telephone. Good quality cell phones with a clear signal also work. Avoid using the speaker function. Call from somewhere quiet - away from pets, children, your spouse or coworkers - where you won't be disturbed. Put a "Do not Disturb" sign on your doorbell or office door. Turn off the TV and any music. Mute: When necessary, use the "mute" button on your phone to keep out background noises, breathing, coughing, sneezing, etc. Don't use the "hold" button FOR ANY REASON. It might make a buzzing in the line that can be heard by other callers. If you are calling in from work and have "music on hold," the music will be heard by the other participants and interrupt the call. Be on time! Have the conference call phone number and participant access code (if any) ready so you don't have to search for it at the last minute. Try to call in just a minute or two before the official start time. No answer: If the phone rings but you get no answer - or if the participant access code will not work - you might have misdialed or you are calling at the wrong time. Check the number and the time (and the code) and redial. If you arrive late, do not interrupt the prayer. Remain silent and catch up as best you can. 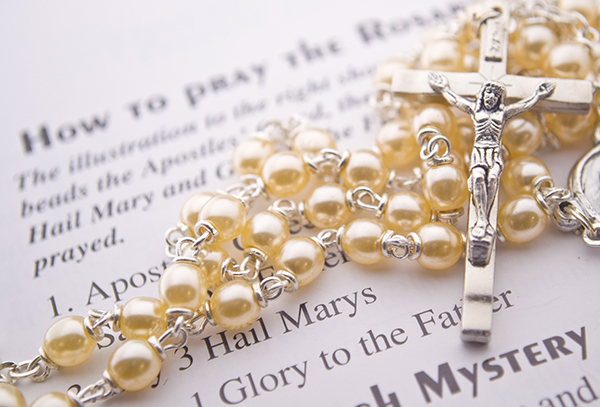 Focus on the call: Be courteous to your conference call leader and your fellow participants by giving your full attention to the prayer of the Rosary. When the call is over, feel free to say goodbye to everyone and hang up. If you must leave early, do not interrupt the prayer by announcing your departure. Just hang up.